Known for our famous “$1 Pound of Ice Cream” you can now carry your keys with our hand-made billet ice cream scoop, engraved with our logo. This 1/24th scale diecast commemorates our Golden Anniversary (1963-2013) and is the 11th car in the John Force/Bader Family Series of diecasts. This car is decorated with a premium gold finish to signify our 50th Anniversary! The National Flag and our red, white and blue team colors complete with stars and stripes are included to exemplify our patriotism and pride for this great Country! Our special 50th Anniversary logo completes the theme of the car. Perfect for your casual décor, this vintage-inspired tin sign would work great in any man-cave or rec room. Rustic metal construction with a wire hanger complete the look. 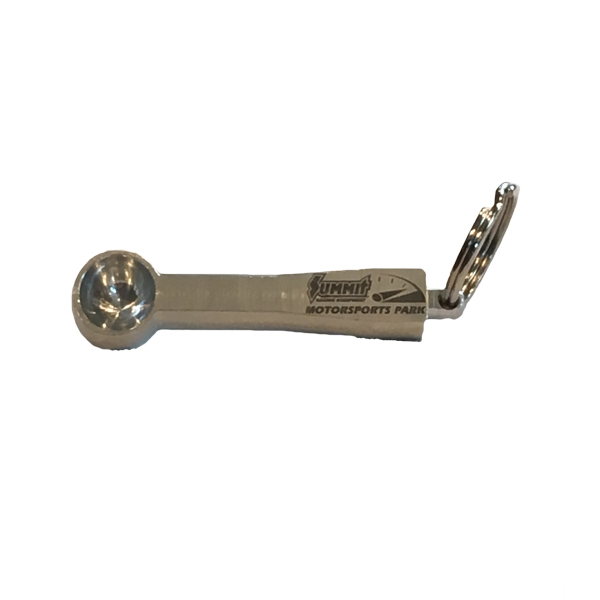 Carry your keys on this classic canvas keychain with silver rectangle etched with the Summit Motorsports Park logo. By subscribing to our mailing list you will always be updated with the latest news, special offers and more! Copyright © 2015 Summit Racing Equipment Motorsports Park | All Rights Reserved.